The Lake Champlain Fish and Wildlife Management Cooperative (Cooperative) will be applying lampricides to portions of five tributaries to Lake Champlain and two deltas during the months of September and October. The U.S. Fish and Wildlife Service, Vermont Department of Fish and Wildlife, and New York State Department of Environmental Conservation will be treating the Saranac River delta, Mill Brook delta, Mill Brook, Great Chazy River, and Mount Hope Brook in New York and the Winooski and Missisquoi rivers in Vermont as part of the Cooperative’s long-term sea lamprey control program for Lake Champlain. 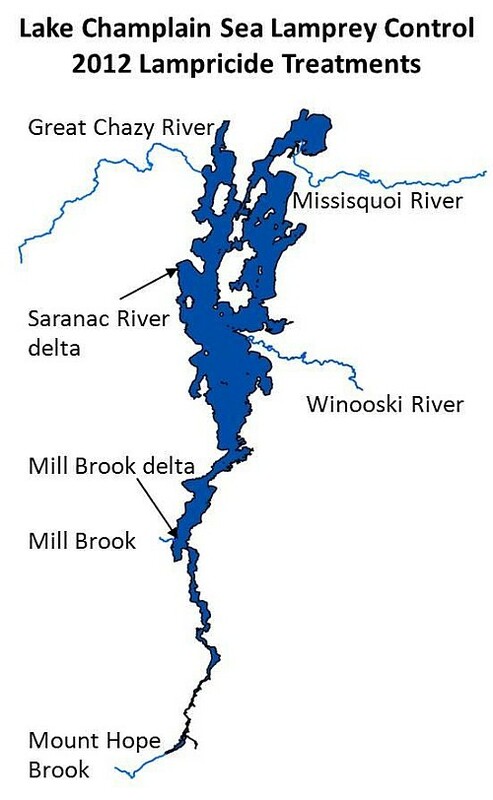 Treatments are scheduled to begin with the Saranac River delta on September 10th, but weather conditions may affect planned treatment dates. While trout and salmon populations of the lake are the primary beneficiaries of these efforts, lake sturgeon, walleye, and many other species also benefit from sea lamprey control. Sea lamprey control also generates economic activity by increasing angling opportunities and the time that boaters, anglers, and their families spend in the Lake Champlain area. Annual sea lamprey assessments continue to show the success of the program where we recorded an average of 30 sea lamprey wounds per 100 lake trout and 19 per 100 Atlantic salmon in 2011. This is down from a high of 99 for lake trout in 2007 and 79 for Atlantic salmon in 2003. Several control initiatives are underway that will further reduce the sea lamprey population and reduce their impacts on Lake Champlain’s fish populations. Larval sea lamprey live in rivers and on deltas for about four years before transforming to their parasitic phase and emigrating to Lake Champlain where their effect on the fishery becomes apparent. One of the Cooperative’s Integrated Pest Management approaches is to apply selective pesticides (lampricides) to rivers and deltas in prescribed and precise concentrations. The concentrations used are carefully chosen and monitored to ensure effective elimination of sea lamprey larvae and protection of non-target species. TFM (3-trifluoromethyl-4-nitrophenol) will be applied in the rivers for 12-14 hours depending on conditions. A second lampricide, Bayluscide 20% Emulsifiable Concentrate, is being included in the application on the Winooski River. The use of 1% Bayluscide with TFM reduces the amount of TFM needed by about 40%, resulting in a reduction of total lampricide applied and substantial cost savings. The Saranac River and Mill Brook deltas will be treated with Granular Bayluscide: lampricide-coated sand grains that release pesticide after sinking to the bottom where they effectively kill sea lamprey larvae. Our toll-free number (1-888-596-0611) provides information on the treatment schedule for each of the treatments, progress reports, updates on treatments, and water use advisories. Temporary water use advisories will be in effect for each of the treatments to minimize human exposure to affected waters. Each state’s Department of Health recommends that the treated river and lake water not be used for drinking, swimming, fishing, irrigation, or livestock watering while the advisories are in effect. The treatments and water use advisories will have no effect on most residents in the Champlain Basin and no municipal water supply systems will be affected. Cooperative staff have identified all landowners with property in the affected areas. A letter was sent to residents informing them of the planned treatment and asking them if they or their livestock use water from a surface supply that will be affected by the treatment. Days before the treatments begin, another letter will be sent to inform residents of the impending treatment and to arrange any water usage accommodations. 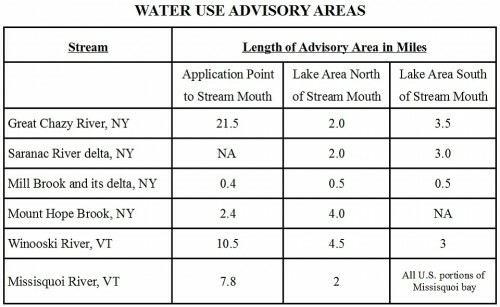 Grand Isle, Vt – The Lake Champlain Basin Program’s 2012 State of the Lake and Ecosystem Indicators Report was released today. The report, produced every 3-4 years, informs citizens and resource managers about Lake Champlain’s condition and provides a better understanding of threats to its health and opportunities to meet the challenges ahead. Lake Champlain’s nonpoint source phosphorus target loads and in-lake concentratios are still too high. Phosphorus trends in some tributaries are improving, such as the Pike River which flows through Quebec and Otter Creek in Vermont. 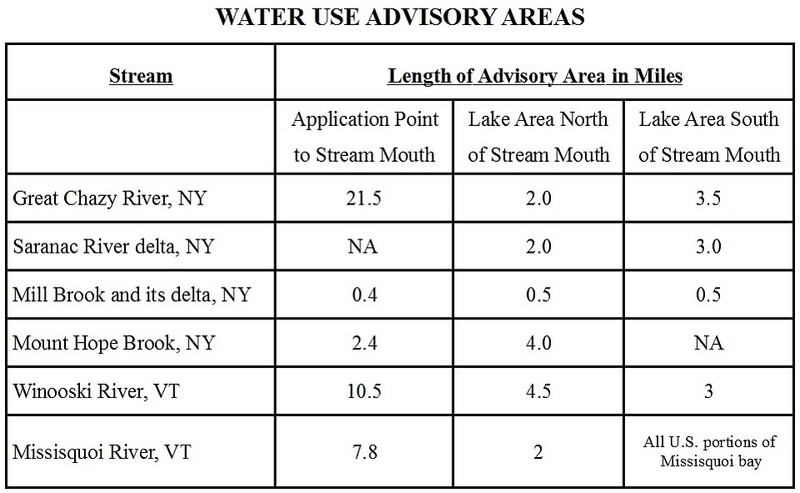 Some of the Lake Champlain embayments are generally meeting their phosphorus targets including Cumberland Bay, Burlington Bay, Shelburne Bay, South Lake B. 2011 spring and fall floods boosted nutrient levels in most sections of the Lake to the highest annual average since the initiation of the Lake Champlain monitoring program in 1992. Data collected in 2011 for sportfish in Lake Champlain reveal substantial declines in mercury levels in the tissue of walleye, lake trout and yellow perch. Fish mercury levels should continue to improve with newly issued US EPA regulations on mercury emissions from coal-fired power plants. New York State has lifted most special fish consumption advisories for Cumberland Bay (near Plattsburgh) due to reduced PCB concentrations. By monitoring fish tissue samples, NYSDEC has been able to track progress over time on the decreasing PCB levels. Sea lamprey wounding on lake trout and Atlantic salmon has dropped to the lowest rates since monitoring began in 1985. Nesting populations of double-crested cormorants have dropped 50%. Scientists have documented recent changes in the biological communities of the Lake’s food web, such as declines in zooplankton populations. 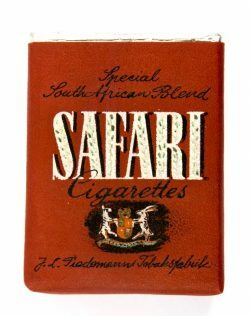 These can cause a ripple effect all the way up to the top predators. State and Federal partners conduct annual surveys of the open water fish communities. Data suggest that native rainbow smelt numbers are declining while alewife are becoming more abundant. More than 1900 acres of wetland habitat has been restored or enhanced through the US Fish and Wildlife Service’s Partners for Fish and Wildlife Program since 2009. This success was due to willing landowners working with federal and state partners and nongovernmental conservation groups including local watershed groups and Ducks Unlimited. In the southern portion of Lake Champlain, water chestnut populations have been reduced to their southernmost point since 1999, about 6.5 miles south of Benson, Vt. More than 200 acres were mechanically harvested in 2011. Round goby, Asian clam, and spiny waterflea are three aquatic invasive species on the doorsteps to Lake Champlain. Anglers, boaters and other recreational users must all remain diligent in preventing the spread of invasive species. Cyanobacteria blooms remain a concern especially in Missisquoi Bay. Similar to other lakes around the world, cyanobacteria blooms continue to be a nuisance with human health implications. While most days it is safe to swim in Lake Champlain, beach closures remain a concern in the Lake, particularly in the northeast arm. The 2012 State of the Lake and Ecosystem Indicators report is now posted on-line: www.lcbp.org/PDFs/SOL2012-web.pdf. For further information, contact, the Lake Champlain Basin Program at (802) 372-3213. The Lake Champlain Fish and Wildlife Management Cooperative will be applying lampricide to portions of four tributaries to Lake Champlain and a delta complex during the months of September and October. The U.S. 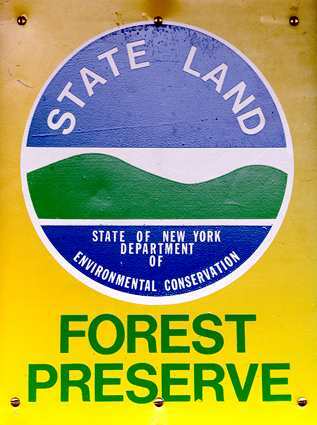 Fish and Wildlife Service, Vermont Department of Fish and Wildlife, and New York State Department of Environmental Conservation will be treating the delta complex at the mouths of the Little Ausable and Ausable rivers, and the Boquet River, Mount Hope Brook, and Putnam Creek in New York. The Poultney River, which borders both states, including its Hubbardton River tributary in Vermont, will also be treated. Treatments are scheduled to begin with the delta complex in New York on September 7th. Lake level and weather conditions may affect scheduling and could result in the last treatment extending into October. These treatments are part of the Cooperative’s long-term sea lamprey control program for Lake Champlain. While trout and salmon populations of the lake are the primary beneficiaries of these efforts, lake sturgeon, walleye, and many other species also profit from sea lamprey control. Larval sea lamprey live in rivers and on deltas for four years before transforming to their parasitic phase and emigrating to Lake Champlain where their effect on the fishery becomes apparent. One of the Cooperative’s Integrated Pest Management approaches is to apply selective pesticides (lampricides) to rivers and deltas in prescribed and precise concentrations. The concentrations used are carefully chosen and monitored to ensure effective elimination of sea lamprey larvae and protection of non-target species. TFM (3-trifluoromethyl-4-nitrophenol) will be applied in the rivers for 12-14 hours depending on conditions. This year, for the first time in the Lake Champlain Basin, a second lampricide, Bayluscide 20% Emulsifiable Concentrate, is being included in the application on the Boquet River. The use of 1% Bayluscide with TFM reduces the amount of TFM needed by about 40%, resulting in a reduction of total lampricide applied and substantial cost savings. The delta area around the Little Ausable River and Ausable River mouths will be treated with Granular Bayluscide: lampricide-coated sand grains that dissolve after sinking to the bottom where they effectively kill sea lamprey larvae. Our toll-free number (888-596-0611) provides information on the treatment schedule for each of the treatments, progress reports, updates on treatments, and water use advisories. Local television and radio stations will broadcast the dates when advisories begin and expire. The treatment schedule is subject to change as weather conditions, stream flows, or logistical issues may arise during the treatments. Residents will be kept apprised of any such changes through these media. Annual assessments show sea lamprey wounding rates have been reduced from a high for landlocked Atlantic salmon of 79 wounds per 100 fish in 2003 to our management goal of 15 per 100 fish, reached for the first time in 2010. The lake trout wounding rate of 99 wounds per 100 fish seen in 2006 has been brought down to 40 per 100 fish in 2010. Several control initiatives are underway that will further reduce the sea lamprey population and reduce their impacts on Lake Champlain’s fish populations. Sea lamprey control generates a favorable economic benefit/cost ratio by increasing angling opportunities and the time that boaters and anglers spend in the Lake Champlain area. 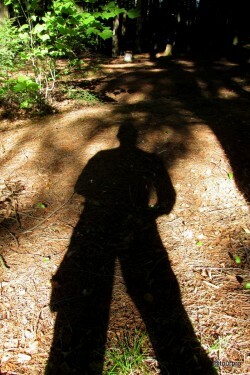 Please contact Bradley Young, of the US Fish & Wildlife Service at (802) 872-0629 x19 if you have any questions.